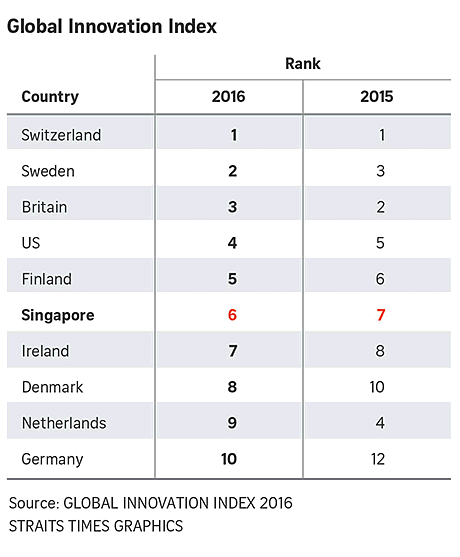 SINGAPORE - Singapore has been ranked sixth in the world - and top in the Asia Pacific region - on the annual Global Innovation Index. Singapore's ranking - one up from last year - placed it ahead of countries such as the Netherlands, Germany, the Republic of Korea and Japan. The improved ranking was driven not just by its performance but also tweaks to survey methodology, such as the addition of new indicators. The Global Innovation Index, now in its ninth year, is co-published by Cornell University, business school Insead, and the World Intellectual Property Organisation. This year's index surveyed 128 economies, using 82 indicators to gauge both innovative capabilities and measurable results. Singapore did well on indicators gauging a country's political and regulatory environment, education system and infrastructure among others. However, it came in 78th on innovation efficiency, which measures how much innovation output a country is getting for its inputs. Singapore also ranked 21st among high-income economies and 22nd overall for innovation quality - measured in terms of the quality of local universities, internationalisation of local inventions and the number of citations that local research documents receive abroad. Its scores for the quality of local universities and patents filed were above the high-income group average. When it comes to the number of citations, however, Singapore performed below this average. The Index report also said innovation policies should more explicitly favour international collaboration and the diffusion of knowledge across borders. The survey also found that global research and development expenditure grew 4 per cent in 2014, much slower than the annual rate of about 7 per cent before the financial crisis in 2009. This was a result of slower growth in emerging economies and tighter research and development budgets in high-income economies, and remains "a source of concern", according to the report's authors.